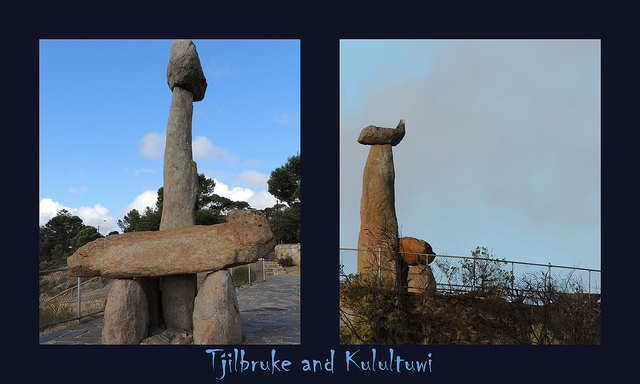 Tjilbruke is pivotal to the creation theories of the Kaurna people. He is an important Creation Ancestor in the lore of the Adelaide Plains. His tale tells of a time when peaceful laws governed the land and people. Tjilbruke lived as a mortal man and was one to whom the law was entrusted. Tjilbruke’s nephew, Kulutuwi was killed as punishment for breaking the law by killing a female emu. 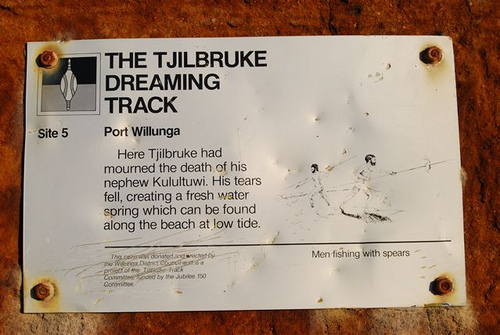 Tjilbruke then carried his nephews body down the Fleurieu Peninsula coast into Ngarrindjeri country near Goolwa. 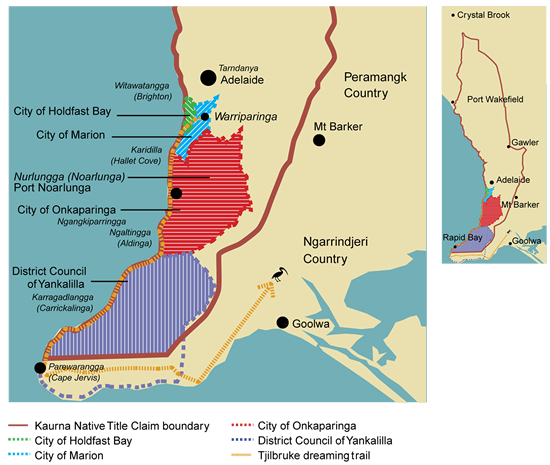 Where Tjilbruke rested on his journey, his luki (tears) of overwhelming grief formed the freshwater springs at Kareildung (Hallett Cove), Tainbarang (Port Noarlunga), Potartang (Red Ochre Cove), Ruwarunga (Port Willunga), Witawali (Sellicks Beach), and Kongaratinga (near Wirrina Cove); this trail is known as the Tjilbruke Dreaming Tracks. 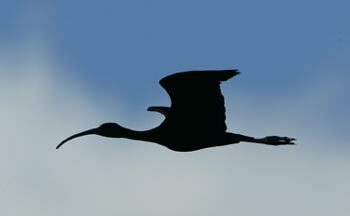 Eventually Tjilbruke placed the body of his nephew into a cave at Rapid Bay and transformed himself into the glossy ibis bird, known in the Kaurna language as Tjilbruke. Since colonization an effort has been made to preserve the Tjilbruke Dreaming Tracks but because of the nature of the modern landscape the trail is spread over public and privately owned land. This has made it difficult to maintain certain sections of the trail. Monuments to both Tjilbruke and Kulutuwi as well as commemoration plaques have been erected along the trail which have become tourist attractions in themselves. Most parts of the trail are easily accessible to the public with markers signifying significant Indigenous sites beginning at Hallett Cove and stretching down the south coast as far as Rapid Bay. Rod Lucas, Lecturer, Honours Coordinator University of Adelaide Department of Anthropology. Watch this short video to learn more about the history of the Tjilbruke Springs and the Kaurna nation : http://www.youtube.com/watch?v=fSQ6AkPjbz4.